Through more than 30 standalone charter management organizations (CMOs) that focus on high expectations, empowered teachers, and a nurturing environment, KIPP helps students develop the knowledge, skills, and character to succeed throughout their education—and in the world beyond. The KIPP Foundation provides these CMOs with technical, funding, and programmatic support and also manages growth and expansion. It has goals for each student, such as completing applications to at least nine colleges and the FAFSA, and getting admitted to competitive schools—activities they’ve discovered increase the likelihood a student will graduate from college. To better correlate these activities with college completion, KIPP also tracks information about colleges, where students matriculate to, and alumni graduation rates. But prior to Salesforce, KIPP lacked a unifying database to easily track if its student body was meeting these targets—and how its model of teaching and learning was impacting college graduation. “We had metrics we wanted to measure success against, but we didn’t have a single place and a single way of understanding the progression of our alumni,” says Michelle Bruce, KIPP’s Senior Director of Technology & Technology Innovation. In 2009, KIPP used the Salesforce platform—Force.com specifically—to power its unified KIPP Through College (KTC) alumni tracking system. 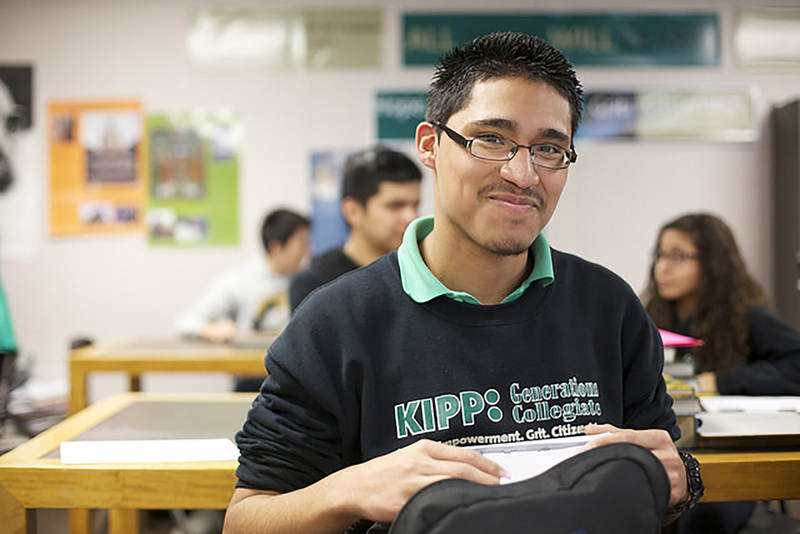 With KTC, KIPP can determine the performance indicators that are the key predictors of college success. The result? Continuous improvement of instructional practices and counseling approaches. Force.com simplifies the development and deployment of cloud-based applications. The initial KTC build took just three months with the help of Exponent Partners, and the Foundation itself continued to develop features long after that—made easier by the flexibility of the Salesforce platform. Now, KIPP has the data it needs to measure its student and alumni success, allowing it to tweak instruction as necessary—and to continue with the programs that are proven to succeed. KTC tracks individual and cohort student and alumni information. Salesforce makes it easy to extrapolate the data in many useful ways. These insights have been invaluable to KIPP. It mines this data to codify and drive college counseling and persistence strategies across schools nationally. The KIPP Foundation was so happy with its Salesforce experience that it returned to the platform in 2012 to build a new, single-application portal where prospective teachers and other staff can apply for jobs with any school from anywhere, including on their mobile devices. Late in 2016, KIPP turned to Salesforce as the foundation for its new donor management strategy—tracking information such as contact details, manual and automated communications, how relationships are being cultivated, and grants received. Its old system for doing so was badly dated and not very usable. Eight staff members used to painstakingly enter individual data, and only three people could be in the system at the same time. With Salesforce, concurrent log-ins aren’t an issue, data can be updated en masse, and the time required to pull reports is cut significantly, according to Bruce. All of this means that staff can focus on what matters most. KIPP greatly values that Salesforce.org—itself a nonprofit social enterprise—makes its solutions and trainings affordable for nonprofits and education institutions, working to support schools—and kids—across the country.